Registration is open for the Legends National Cup Powered by Inside Lacrosse and Surf Cup Sports. Legends and Inside Lacrosse come together to provide a high quality and rare opportunity for an unmatched experience for all in attendance! 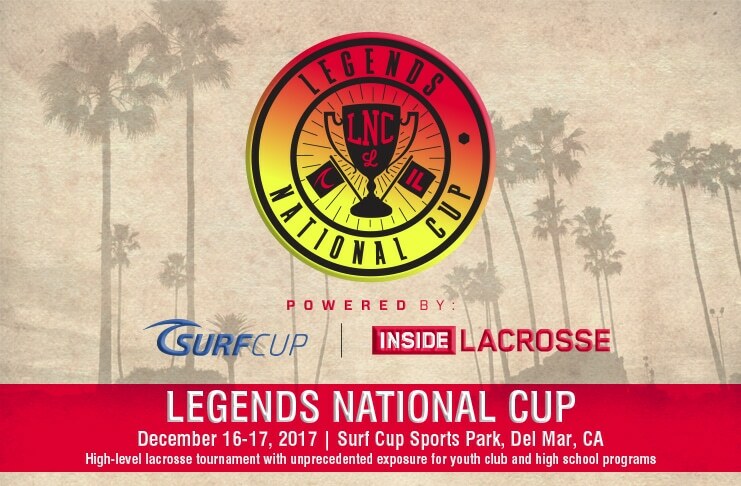 The Legends National Cup powered by Inside Lacrosse and Surf Cup Sports will take place on December 16 and 17, 2017 at the Surf Cup Sports park, formerly known as the San Diego Polo Club. Just a few miles from the ocean and a short trip to all hotels, restaurants, tourist attractions and the San Diego Airport the on field and off field experience will be like no other event. DIVISIONS: Boys– U11, U13, U15, HS, Elite. Girls– U13, U15, HS, Elite. PRICE: Boys- $2100/team. Girls- $1650/team. Inside Lacrosse Snapchat takeover at the event!